Ideal Diet | Let this be your last. I mentioned in my last post that I have started to take the easy way out when it comes to my cooking. But taking the easy way out doesn’t have to mean bland and boring. I never thought I was capable of making something as extravagant as rack of lamb at home. I mean, that’s reserved for fancy restaurants, right? But I found a way! All you need to do is follow a few simple directions, and you can make a gourmet-style, delicious meal. Lamb is not allowed on Phases 1, 2, or 3, so it makes a great phase 4 dinner. Lightly sprinkle the lamb with Chimichurri Spice Blend. 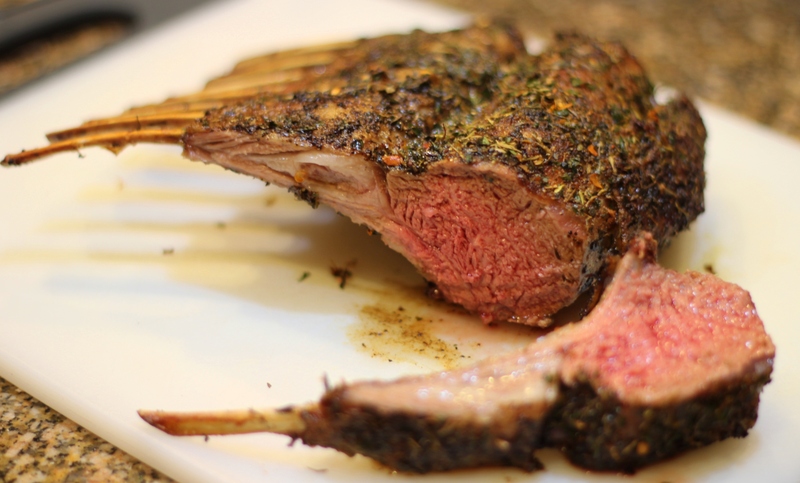 Place lamb rack in the skillet and cook just until brown, about 3 minutes per side. Transfer the lamb rack to a baking sheet. Re-season the entire lamb rack with Chimichurri Spice Blend. Bake for 15 minutes for medium-rare. Allow lamb to sit for 10 minutes before carving into chops to serve. 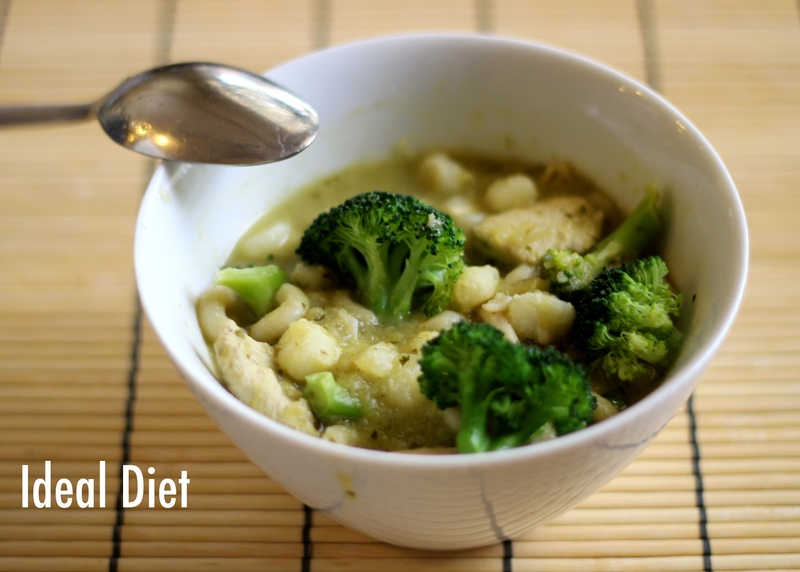 If you’d like to receive more healthy recipes directly to your inbox, subscribe to Ideal Diet for free. And if you try any recipes and find ways to make them better, please share your comments with us. When I started this blog, I often asked my clients if they made any of the recipes I posted. Very few people made them. Most people didn’t have time. After a long day of work, traffic, tending to the kids, etc. the last thing anyone wanted to do was cook! Even though the recipes I share are easy, it was still hard for people to take the time to make them. l also discovered that people get bored eating plain food (duh!) and that many people don’t know how to make healthy food taste great. These are huge barriers to success on any healthy eating plan. So I decided to find a solution. Around the same time, an elementary school classmate of mine approached me to create a line of dry rubs for his website. We hadn’t seen each other in almost 30 years, and the timing was perfect! I introduce to you the game changer: aloha rubs. And you can blame them for why my recipes have slowed down. After months of testing and modifying the spice blends to come out just right, I still eat these all the time. I have very little incentive right now to make anything else because they are so good (if I do say so myself) and easy. There are 4 different spice blends: Cajun, Chimichurri, Chile-Cocoa, and Jerk. I hope I can help you enjoy healthy eating because I know it is possible. 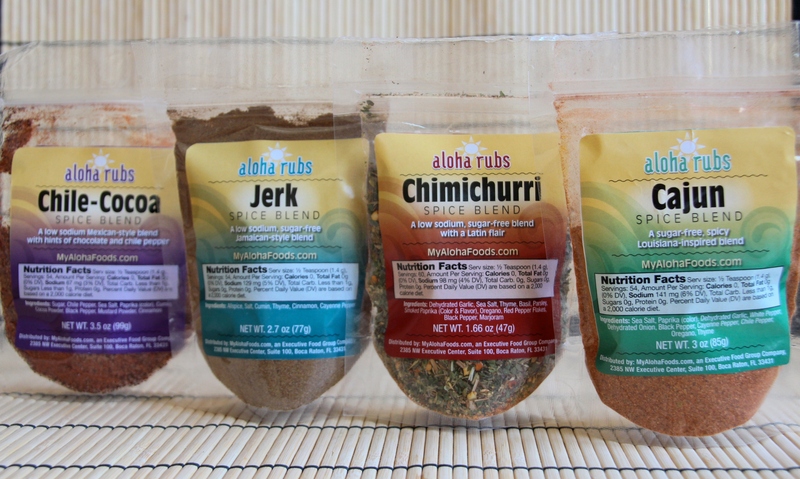 Coming soon, I will share some of the ways I have used Aloha Rubs to spice up my life! But until then, if you try Aloha Rubs, it’s simple. All you have to do is come home at the end of your day, season the protein of your choice, and throw it on the grill or in the oven. It’s as simple and quick as that. Cajun, Chimichurri, and Jerk are all Phase 1, 2, 3, and 4 appropriate. Chile-Cocoa is for Phase 4 only. Every year I personally revisit the Ideal Protein Weight Loss Protocol just to keep things in check. Some people think I’m crazy, but having the knowledge and experience that I do, I see things differently. The way I see it, if I gain 5-7 pounds in a year, why not take care of it when the numbers are so small? Otherwise 3 years from now, my weight might be up 15-21 pounds. We all know it’s much easier to do Phase 1 for 2 weeks rather than 2 months, so I just say, go for it. Nip it in the bud. I also revisit it because it gives me a new perspective each time I do it, and it helps me to stay in touch with some of the things my clients go through. It continues to be an eye-opening experience every year. This year is my 3rd annual shot at it, and I’ve experimented with recipes all week. A lot of my recipes don’t make it onto the blog. I only share stuff that I love. A few days ago, I discovered that Ideal Protein- Lohja, Finland found Ideal Diet and shared it on their Facebook page. I want to extend a giant thank you to them for the lovely compliment and for sharing this blog with their Facebook friends and followers. They also have some fantastic recipes on their page, so go check it out when you’re done here. I also want to extend a big welcome to the new subscribers who’ve recently joined along. You inspired this new recipe, and I think it’s a keeper! 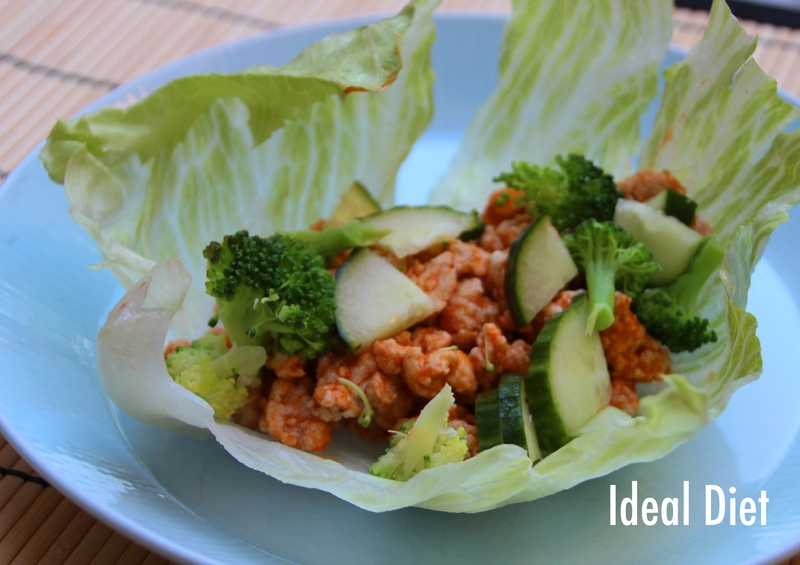 One of the new things I learned this time around is that lettuce wraps rock! I’ve eaten more this week than I have in my lifetime. (Ok, slight exaggeration, but I’ve eaten a lot.) I thought I was being super creative with this recipe, but then I came to find out that I’m not the first to think of this. However… this recipe is my very own. In fact, it’s so easy, it’s almost a non-recipe. Now that’s my idea of a great weeknight meal. Heat grapeseed oil in a frying pan over medium high heat and add ground chicken. Saute until cooked through, breaking into small pieces. Season with sea salt and pepper. Drain extra liquid from pan. Add hot sauce and mix until chicken is well-coated. Optional tips: if you’re in phase 1, 2, or 3 drizzle on Walden Farms Ranch or Blue Cheese dressing. A nice Phase 4 lunch would be to add some blue cheese crumbles. Recipe adapted from the bad attempt at making Asian style lettuce wraps the night before that turned out too dry and bland. This salad makes a great, light addition to your meal. You can either have it on the side, or add your protein to it. Just a little tip about quinoa before I get into this delicious recipe: if it makes you gassy, rinse it for a few minutes before you cook it. The grains are too small to rinse in any of the colanders I have, so I just soak it in a pot of water and drain it using the lid. It’s kind of a pain, but it’s works, and it is well worth it! 4 heads endive, trimmed and separated into individual spears or just add to any type of greens. Add the quinoa, stir once, and return to a boil. Cook uncovered, over medium heat for 12 minutes. Strain and rinse well with cold water and remove all moisture. 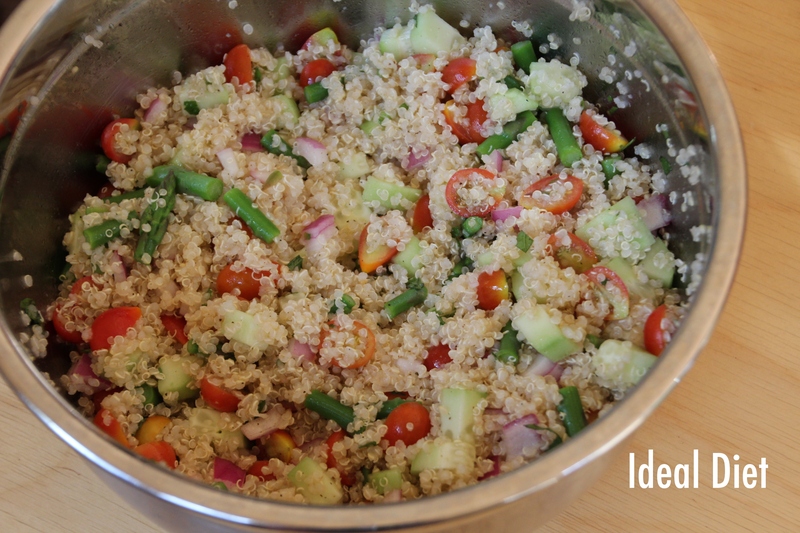 When dry, transfer the quinoa to a large bowl. Add the cucumbers, onion, tomato, parsley, mint, olive oil, vinegar, lemon juice, salt, and pepper and toss well. Spoon onto endive spears or greens, and serve. Did you ever start a project, and then realize months later that you were so caught up with life that you forgot all about it? That happened with this recipe, and as a result I’m sharing a soup recipe just as the weather is starting to change. Who wants to eat soup when it’s 80 degrees out? I do. They eat posole year-round in Mexico, right? It certainly wouldn’t stop me either. Before I get to the recipe, a girl needs to brag… just a little. My Chicken Meatloaf Recipe won the Miracle Noodle Recipe contest last month! Woohoo! In case you missed it, check it out here. Steamed or sautéed veggies of your choice. Season the chicken with 1/2 teaspoon thyme, and salt and pepper to taste; set aside. Heat the oil in a large saucepan over medium heat. Add the onion, jalapeño and garlic and cook until soft, about 4 minutes. Return to the saucepan and cook over medium heat, stirring, until the sauce thickens and turns deep green, about 5 minutes. Add the broth, hominy and chicken to the saucepan. Cover and simmer until the chicken is tender, about 10 minutes. You may be wondering why my title is screaming at you. Well, whenever I think of meatloaf, I can’t help but think of Will Ferrell in Wedding Crashers. If you aren’t familiar with this funny scene, here it is. Warning: there are a few f-bombs in this clip. 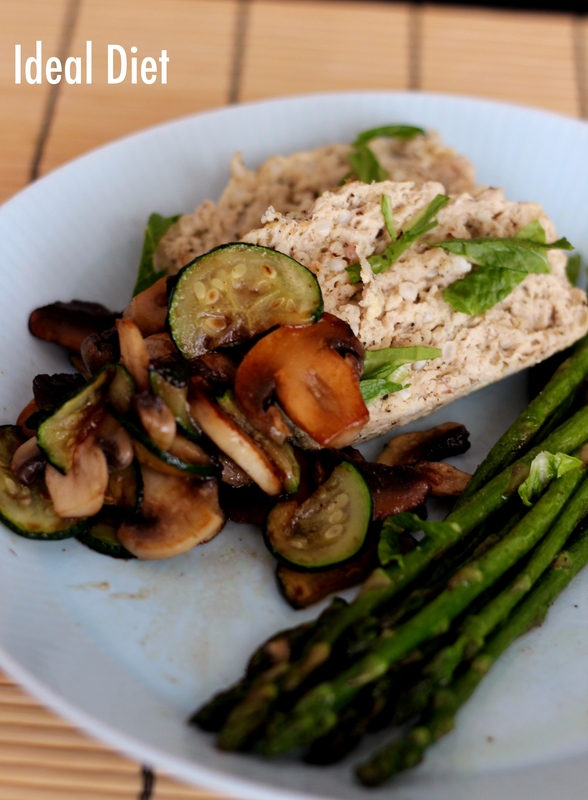 Now we have the perfect Ideal Protein meatloaf… featuring Miracle Rice! This might be my favorite use for the Miracle Noodle products. I loved this. Dry roast the miracle rice by sauteing in a non-stick skillet over high heat for a few minutes, until they are dry. You may hear a squeaking noise as you move them around the pan when they are ready. 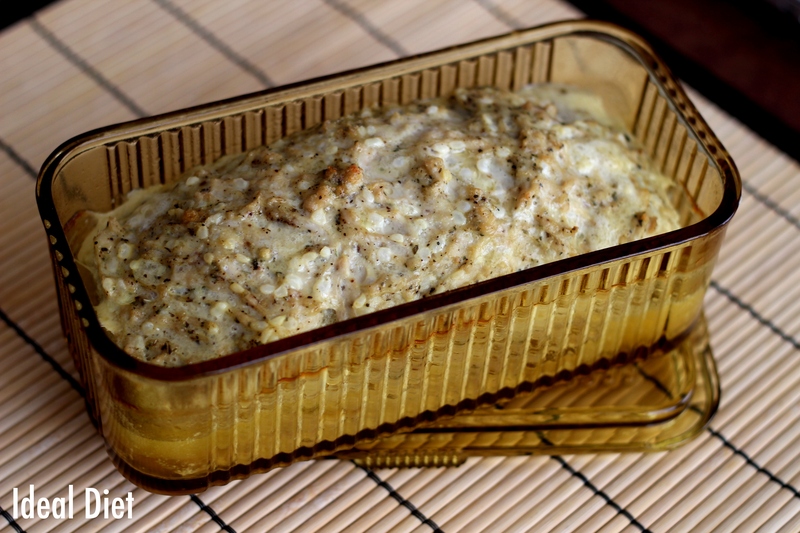 Spray a loaf pan lightly with grapeseed oil. Mix all ingredients including Miracle Rice and add to pan. Broil on high for 5 minutes to lightly brown the top. This is by no means a recipe, but I made it last week and loved it! I wanted to share it here as a reminder that we don’t have to deprive ourselves of everything when we’re trying to lose weight. These must be cooked a certain way for good results, so read carefully! Pour 3 to 5 fl. oz of cold water into a shaker cup, add contents of one Crepe mix, and shake vigorously until mixture is smooth. Heat a non-stick skillet over medium heat and lightly spray with oil. Pour batter into skillet and cook on each side for 2 to 5 minutes. No! Don’t do that, or your pancake will mush up into a ball of dough. Cook the first side until it is cooked through on the top side. You know how the top of pancakes bubble and dry when they start to cook? You want the top side almost completely dry. You will think you are over cooking it, but you are not. Then you can flip it and cook for 30 seconds to a minute or so on the other side. 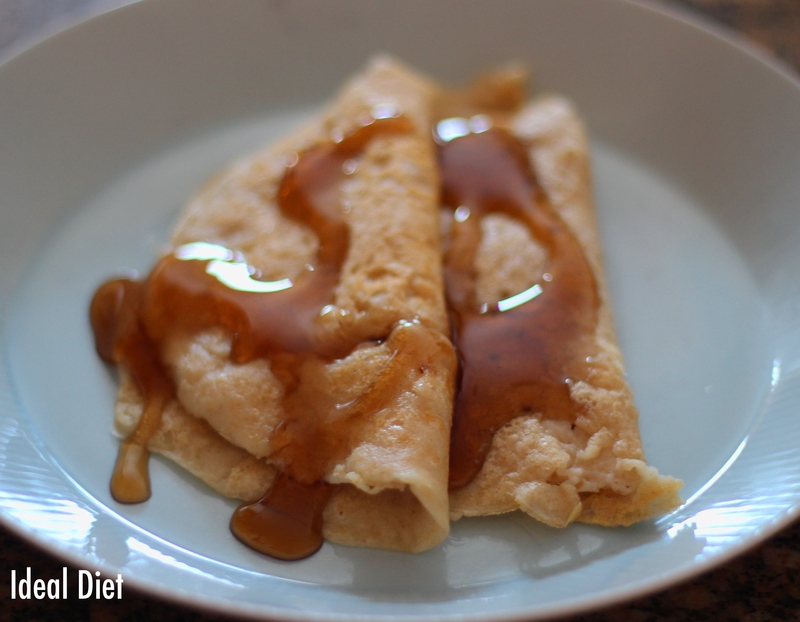 Repeat steps 1-3 with second crepe. Top with Walden Farms Syrup.